It’s true I substitute teach from time to time. I give my substitutes from childhood new respect. Why do I sub? Mainly to pay the bills while enjoying all the luxuries of picking what days I work and being able to stay home frequently with the cute bundle that this blog is all about. Karrigan please be nice to your subs. Yes, I want you to enjoy what will most likely be an easy, laid back day. However I also want you to respect your temporary teachers as much as your full time ones. These people are here to help you. Who knows, if you are frustrated with a class they might even be able to give you a fresh perspecitve on a difficult lesson. 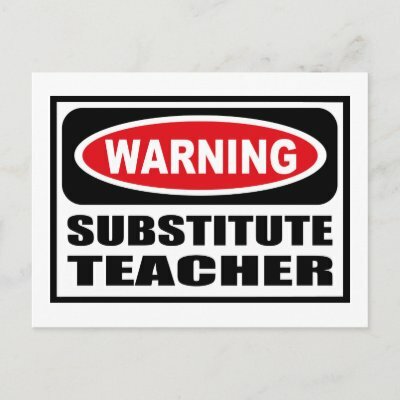 Substitute teachers often get called only an hour or two before they are expected to walk into a class room full of strangers and pick up on any number of subjects and lesson plans. Before you say it is easy I would like to see you try it. I understand that you might not have the same focus as you do when your regular teacher is leading the class, but you should. The day might run different than usaul because the substitue doesn’t know your teacher’s schedule. You might know that you can get away with a little more. I’m just asking that before you work to press your substitue’s buttons you consider what life would be like in their shoes. That maybe you should decide to show some respect to a guest teacher like you would a guest in your home. That perhaps you could be the bright spot in someone’s day that you already are in mine. The main thing here is to remember respect. If you want others to respect you, start by giving it to them.